Customizing vintage outfits with Dinky Craft Brooches – thevintagebeautyspot. d innocent logo. On further investigation I thought to myself: what a hidden gem this account is! 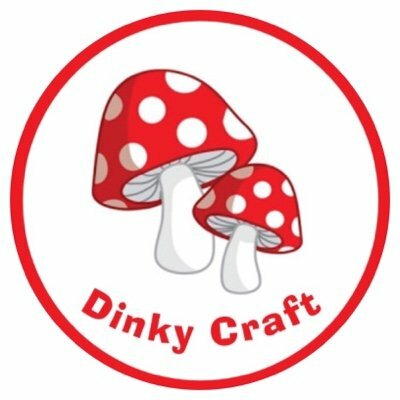 Dinky Craft specializes in brooches and other accessories, inspired by the love of retro. The brooches are beautiful wooden designs, finished so elegantly. One thing which Dinky Craft explains so well is that there is no such thing as too much glitter! Independent businesses take pride in all aspects of their products, even down to the packaging. For Dinky Craft, the aesthetics of the beautiful and ‘shimmering’ red packaging really went above and beyond the confines of normal packaging, suggesting a higher quality of treatment for customers. Needless to say I was very impressed by this personal touch. This, with the addition of fast shipping made me a very happy customer. I currently own 3 Dinky Craft Brooches and plan to expand my collection. I have my eye on the teapot and the umbrella and the unicorn – oh okay, I want all of them. In regards to the vintage feel, Dinky Craft brooches are so ‘modern’ and quirky, yet have a strong retro charm. They are somewhat magical, accessorizing a vintage with these outfits only adds to the vintage feel, without taking away authenticity. Additionally, they add instant glitz and glam to any outfit, also transforming a modern day style into a vintage inspired look. Without further ado, here are my suggestions of how to style an amazing Dinky Craft brooch. How about, a cocktail on a cocktail dress? This Martini brooch appears to be a big seller, and I can understand why! Just look at how fabulous this silver and a little flash of green looks against the hot pink material, emphasizing the bold and clashing features found in other retro looks. It is a perfect addition to this reproduction Lindy Bop vintage dress, alongside a chain of 1940s beads. Quirky, but undeniably vintage! Found that perfect combination but missing the final piece of accessory? The colours of these clothes items are perfect together; the pale blue cardigan accenting the cornflour blues and pastel yellows in this 150s inspired day dress. However, I feel this outfit on its own is missing something – the sunflower brooch is the solution! It’s almost as if this brooch was made for this outfit, reflecting the summer feel and layering the tones of yellow and blue. Moving on from summer, how about transforming a plain black knit dress – essential as a winter warmer! This little gem of colour and shine gives this outfit a character. Not to mention it’s feline shape – perfect for a cat lover *crazy cat lady* like me! It’s a spin on the classic, understated look – yet presents elements of both mystery and confidence. Note that this particular brooch is available in a variety of colours, all equally as perfect alongside a black garment. It is so so important to support small businesses. From experience independent businesses have that extra bit of quality making a product so special and useable. I absolutely adore my Dinky Craft Brooches and I am so excited to purchase more! These brooches really are precious! Good find! Previous Previous post: Mathematical Beauty – Is the Golden Ratio really the key to beauty?